Williams Roofing provides your homes best coverage by utilizing only the finest quality materials from manufacturers with the highest standards and best-earned reputation in the industry. The natural properties inherent in cedar make it the perfect choice for your home's roof. Cedar's resistance to moisture and to other forms of decay is the key to longevity. In addition, cedar is a distinctively attractive wood, characterized by a chromatic spectrum of light amber to subtle honey-brown tones. The aesthetic value of cedar, coupled with its resilience, makes it not only an attractive choice, but also an economical one in the long run. Cedar roofing naturally contributes to keeping in the warmth in the winter, and keeping out excessive heat in the summer, which can add up to significant savings to you for years to come. When you consider that cedar shingles and shakes are also naturally insect resistant as well as being less susceptible to moss growth than typical asphalt shingles, the choice of cedar shingles and cedar shakes is a wise investment for the overall value of your property. Cedar shake roof systems can also be installed with the highest fire protection possible - Class 'A' - allowing for installations in rural and forested areas. A concrete tile roof not only perseveres even when surrounded by majestic nature; this tile also makes its own elegant statement. Our concrete tiles bring you unbelievable choices in design, color and weight. In fact, you can choose your own design....then choose your own color. Concrete tile can match your home's architectural requirements and meet your budgetary needs beautifully! Asphalt shingles are the most popular type of residential shingle used today. The benefits derived from using asphalt shingles include weather resistance, ease of application, low maintenance, and with low cost options. Asphalt shingles can be purchased in several forms including strip shingles, laminated shingles or interlocking shingles. They are the most commonly used type of shingle. They are reinforced with fiberglass or paper and range in durability; typically 20 to 30 years.Asphalt shingles no longer have the reputation of being flat and cheap. Asphalt shingles are now available up to 3/4" thick with a nariety of dimensional designs and rich earth tone collors. Tile comes in a large array of beautiful styles, colors and finishes adding to every home's beauty and styling. There is also a wide selection of carefully blended shades that range from subtle tints to vibrant colors, and wood and slate textures that simulate the natural environment. Slate, or commonly referred to as stone, is very durable but about three times heavier than asphalt. 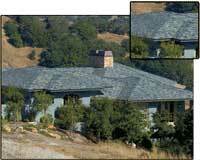 However, a slate roof can create a colorful, handcrafted look that adds to the overall appearance of your home. Slate is waterproof, fire resistant, resilient to climatic changes, and requires no preservative coatings or paint. It also requires no cleaning which results in lower insurance premiums, higher property values, little or no maintenance costs and a high salvage value. Growing in popularity is the metal roof. Metal roofing is a non-combustible, corrosion resistant and fully recyclable product - perfectly suited for today's needs, lifestyles and environmental priorities. It has outstanding durability and is suitable for extreme weather conditions. Various coating processes and a wide range of colors and textures have now advanced modern metal roofing into a product as desirable, attractive and cost-effective as older traditional products. Most houses with flat or nearly flat roofs are topped with built-up roofing (commonly referred to as tar & gravel or hot tar), made from layers of asphalt-coated fiberglass roofing over felt. The top layer of asphalt on these roofs is usually embedded with crushed rock or gravel, which serves to hold the roofing material down and protect it from damage from sunlight. Light-colored gravel also reflects the sun's heat. These roofs can last from 10 to 20 years, depending on the number of felt layers installed and the severity of the weather. PVC/CPA/TPO Single-Ply Membrane roofing has been utilized for over 30 years, and can be installed on any flat or low-pitched roof structure. Each roof is uniquely designed to fit the specific needs of each project. Installing Single-Ply Membrane is easy and practically error free. All the seams and details are mechanically fastened and hot air welded to create a one-piece water proofing membrane over the entire roof structure. This type of roofing system can be installed with a Class "A" rating for flame resistance, unlike old-fashioned traditional roofing materials. Over 90 percent of Single-Ply Membranes roofing can be installed over existing rooftops eliminating the need for messy tear-offs. This reduces landfill usage and helps to preserve our natural resources. Single-Ply roofing not only keeps your house or office building leak free, but is pleasing to the eye. All these attributes give you the maintenance-free roof you want and the confidence you need to relax for life - guaranteed. Specializing in historical, hard-to-find clay and concrete roof tiles, Williams Roofing takes pride in helping you preserve the original vintage look of historical tile roofs. We believe tile roofs are art, each making a statement. A roof composed of vintage tile from Williams Roofing is unique in beauty and style and will assure the classic look of your new home or remodeling project.